A few weeks after the outing to Norfolk I wrote about in the last few posts, I found myself in a place called Conder Green, which lies on a small tributary of the River Lune in Lancashire, with Morecambe Bay to the west and the Lake District to the north east. I stayed in a hotel which was on the Lancaster Canal and surrounded by farmland, and there was lots of wildlife in the immediate vicinity. 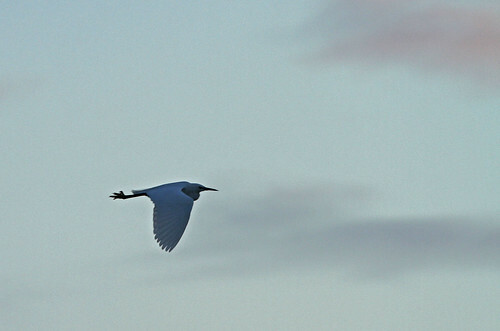 The little egret, or indeed egrets in general, were birds I had always associated with more exotic parts of the world. The first time I saw them in numbers they were perched on fish stalls in the market at Victoria, the capital of the Seychelles. 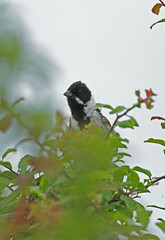 Their numbers have been steadily increasing in England after they first began to colonise here in 1988 having moved across the water from France, where they had also been expanding their range northwards. 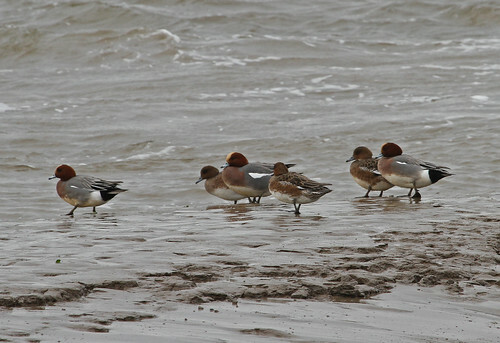 But to see one in Lancashire reminded how far north and west they have migrated compared to the location of my first sighting! 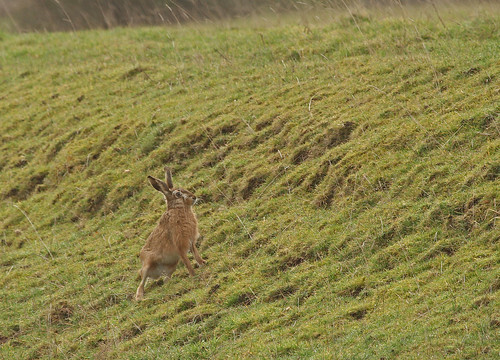 I was pretty happy with these two shots, I’ve previously got some good pictures of hares by creeping up on them very slowly when they’re sitting tight, but I’ve never got a good picture of a hare in full flight before. The hare is a member of a taxonomic group called ‘Lagomorphs‘ along with rabbits and pikas. It’s a group that has been around for 90 million years, so hare-like creatures may have been running around with dinosaurs. The modern version evolved in central Europe but only since the UK split away, geologically that is, from mainland Europe. 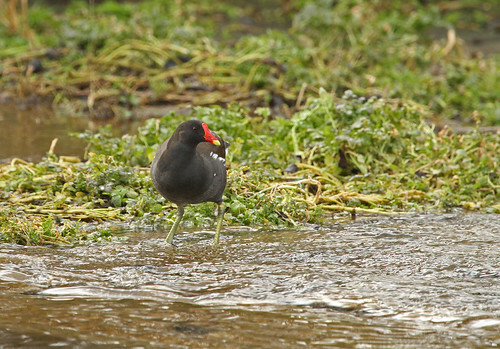 So it is thought that it was introduced to these islands around 2000 years ago by the Romans. 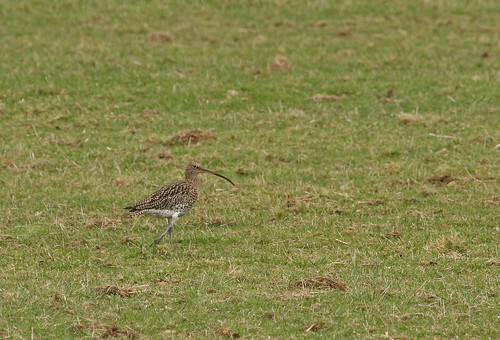 This bird, with its unfeasibly enormous beak, was one of a flock of around 100 curlew, and that’s an extremely unusual sight these days. This weekend my meanderings took me to the open fields Histon and Cottenham, an area I haven’t properly explored for quite a long time. As I set off early on Saturday morning the weather was murky and very cold and consequently I was feeling pessimistic about encountering the local wild creatures. Fortunately I was mistaken. The wild creatures were there aplenty. Flocks of mixed gulls, rooks, Corvus frugilegus, (N.b. I’m planning to make a taxonomic index of Latin names for the species on an adjacent page so I can avoid writing them here), and in particular, wood pigeon, Columba palumbus. Wood pigeon can often be seen in flocks but on this occasion there were many flocks, the largest containing thousands of individuals. They are a farmers curse as they can devastate fields of new shoots, hence the sound of shotgun fire punctuating my progress. My father told me stories of my grandmother being given wood pigeon during World War II – a valuable source of free meat – and when opened up the crops liteally exploded as they were stuffed completely full of fresh green shoots. 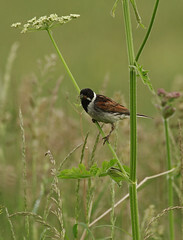 Multiply that up by several thousand birds and the damage they can do to crops is obvious. Still, they’re impressive to watch in those kind of numbers. 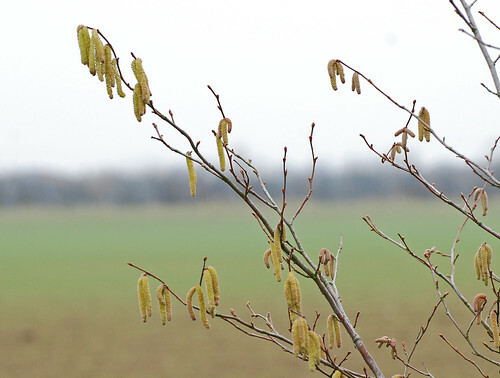 My aforementioned pessimism was tempered by the sight of hazel trees, Corylus avellana, covered in catkins, the first suggestion of approaching Spring time. Hazel saplings festooned with the first catkins of 2011 – Spring is imminent! And indeed, a friend told me on Monday morning she had seen daffodils shooting in the village. So I reckon that makes it official. 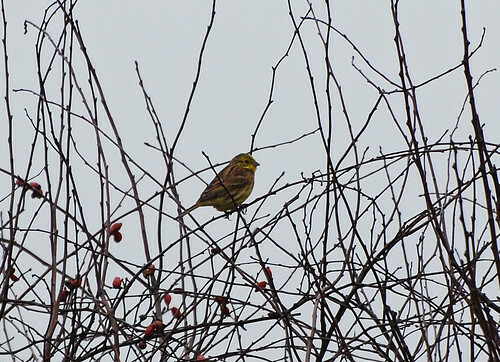 In the same hedgerow as the catkins – the Merlin Hedge – (click here for a sketch map of my walk route), were a flock of greenfinch, Carduelis chloris, and a small group of fieldfare, Turdus pilaris, feeding on the ground. 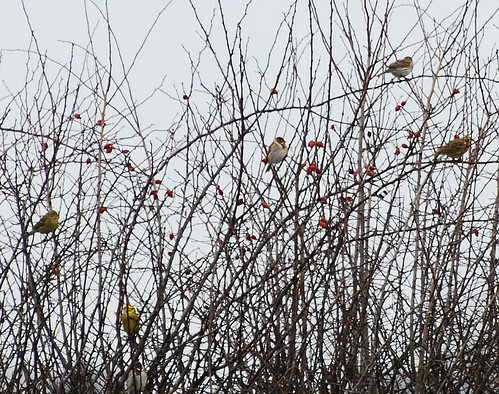 The greenfinch were manic, chasing each other as a flock around the fields either side of the hedgerow. 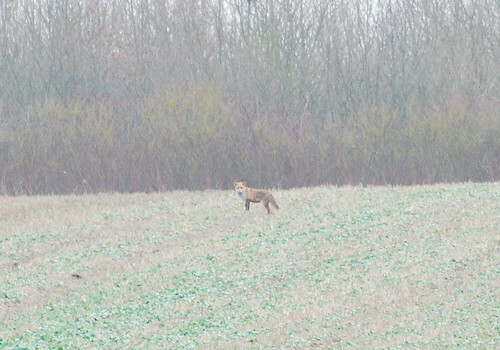 The fox was around 300m away and the quality of the image gives a good idea of the murky grey weather condiitions. Doesn’t convey how cold it was though! This one has a distinctly grey coat and I’ve seen foxes in this area before with similar coloration, so it could be the same one or one of his offspring. He’s close to where foxes reared a litter of cubs last year so he could be one of that family. After the excitement of seeing the fox, I was scanning the adjacent field for any other signs of life and spotted a second fox – it could have been the same one but he’d have had to move very fast to get to the second location. 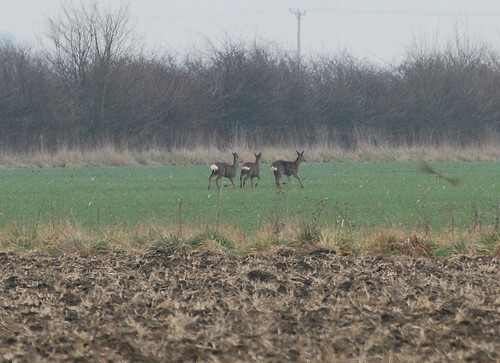 And as it disappeared through a hedge a group of three roe deer, Capreolus capreolus, entered the same field. The dog spotted the deer as soon as I did and immediately pricked his ears up, he was around 25m away from me and in order to avoid any dog/deer interaction I called him and the deer instantly turned to look even though they were around 300m away. They have incredibly acute hearing. 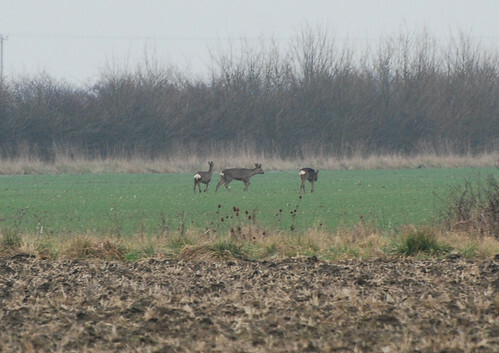 Between us and the deer were a flock of skylark, Alauda arvensis, on the ground (it could be one of them taking off in the photograph). 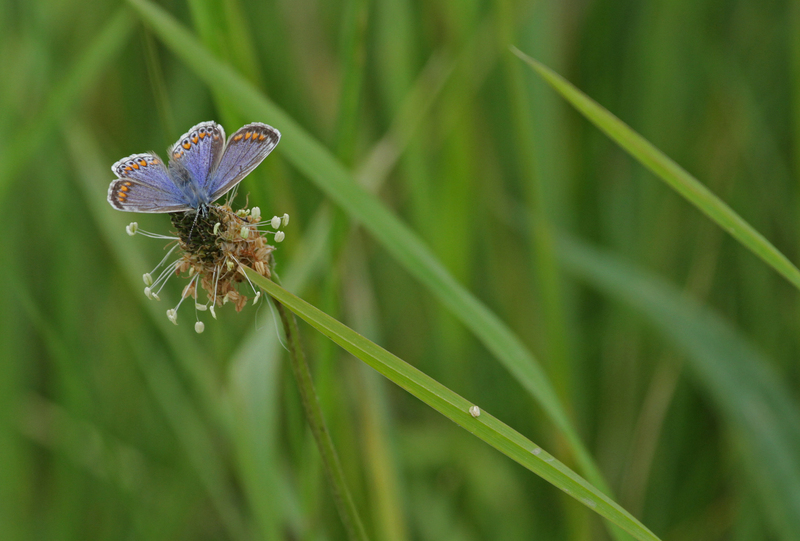 It was impossible to count them accurately as they were whizzing around at very high speed close to the ground where their camouflage rendered them almost invisible, but I estimate there were between 10 and 20. 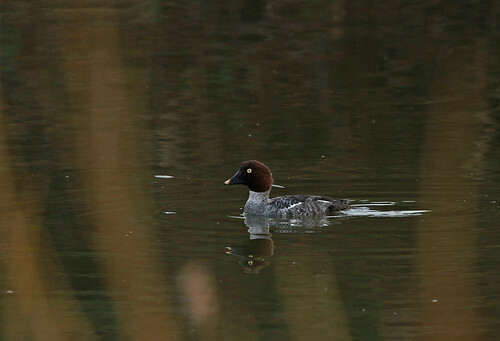 …and a male of the species. What a glorious colour! Both species were numerous and could be seen flying around the hedge all the way along to the Owl Shed and dropping down onto the ground to look for food and to hide from me. 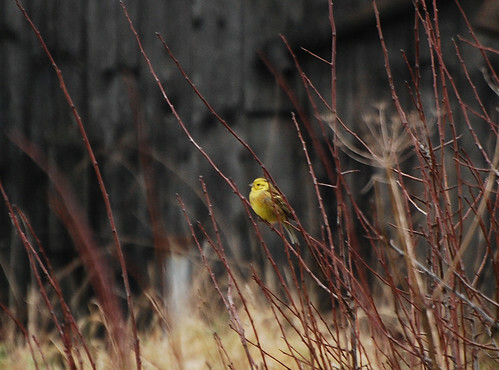 The remainder of my Saturday morning sojourn was not quite so lively but numerous fieldfare, redwing (Turdus iliaca), chaffinch (Fringilla coelebs) and a kestrel (Falco tinunculus) were busy around the pig farm. On Sunday 30th January the weather was brighter and more mild so I set off again towards the Owl Shed to try to get some more photographs. 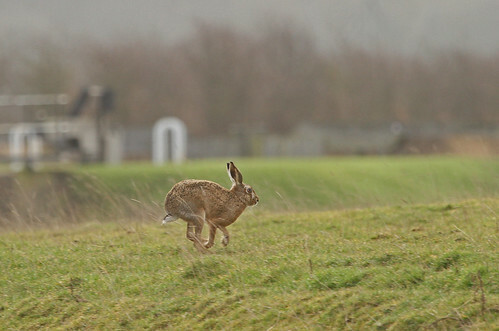 Despite the improved weather there was nowhere near the amount of wildlife around I’d seen the day before, although a hare (Lepus europaeus) appeared in the field where I first saw the fox. 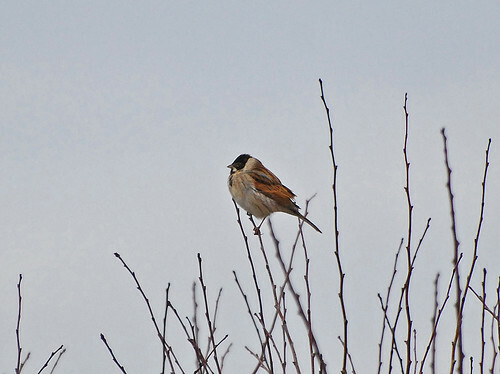 And fortunately the reed bunting and yellowhammer were still in the end of the hedgerow where I’d left them on Saturday, although not in the same numbers. So I got my pictures and then had to rush home to get off to my nephews 18th birthday party. 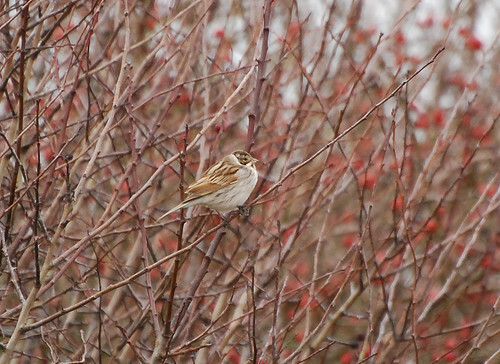 A very enjoyable weekend all round, and in particular the Emberiza species congregated in the Owl Shed Hedge.